Juwan Washington’s impressive 96-yard kickoff return for a touchdown Saturday to give San Diego State an early 7-0 lead in the win against Northern Illinois has earned him the Mountain West Special Teams Player of the Week, the league announced Monday. This honor is the first career weekly award for the sophomore running back. The kick return for a score was Washington’s second in his career and it was his second overall touchdown this year. The Texas native has rushed for 239 yards so far this season on 56 attempts and one TD. He has 10 overall touchdowns for his career. 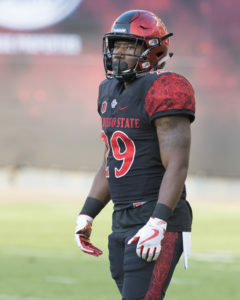 With this award, San Diego State became the first team in the Mountain West Conference‘s history to win a Player of the Week award for each of the first five weeks of a season. The Aztecs, which also lead the nation in kick return average, is the only school in the NCAA’s Football Bowl Subdivision to have a kick return touchdown from two different players, the other being Rashaad Penny, so far this season. After the win against the Huskies on Saturday, the Aztecs remained at No. 19 in the Associated Press Poll and No. 21 in the Amway Coaches Poll. This is the first time San Diego State has been 5-0 since 1975 and the second time in the last 47 seasons. SDSU next faces UNLV at 7:45 p.m. Saturday in Las Vegas.